Nine West navy blue patent leather Mary Janes. I found these lovelies at Nordstrom Rack and fell in-love immediately. I love patent leather, I love Mary Janes, and the fact that these were BLUE instead of the expected black…sold! I have wanted to hem this skirt since I bought it, but it just hasn’t happened yet. Today was the first time I tried belting it and on my 40 minute lunch break I received three separate compliments. Perhaps belting is the way to go instead of hemming? Thoughts? 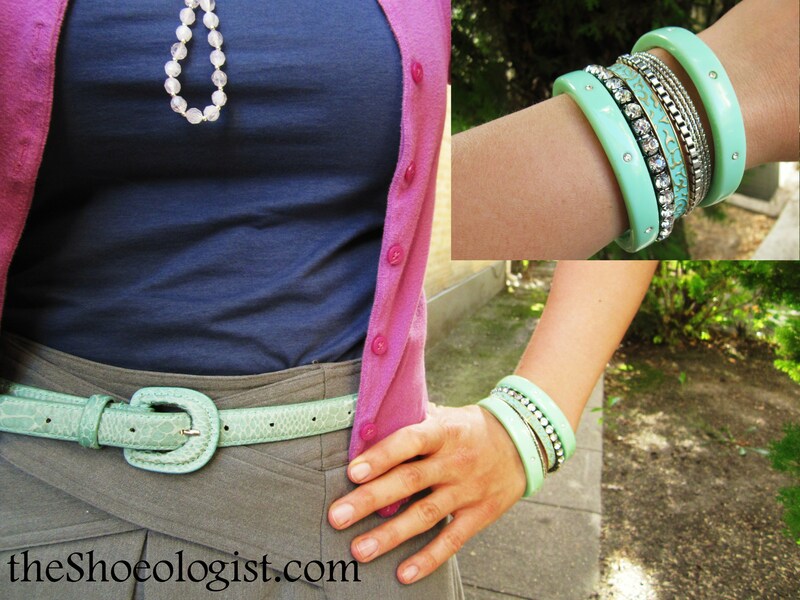 I do not own anything this minty green color, but when I saw the snakeskin belt for $1.00 at a thrift store I couldn’t not take it home (this is a recurring problem with me, I’ve found). When I saw the minty-green J. Crew bracelets on sale I had to have them (see it again? The shopping problem?). 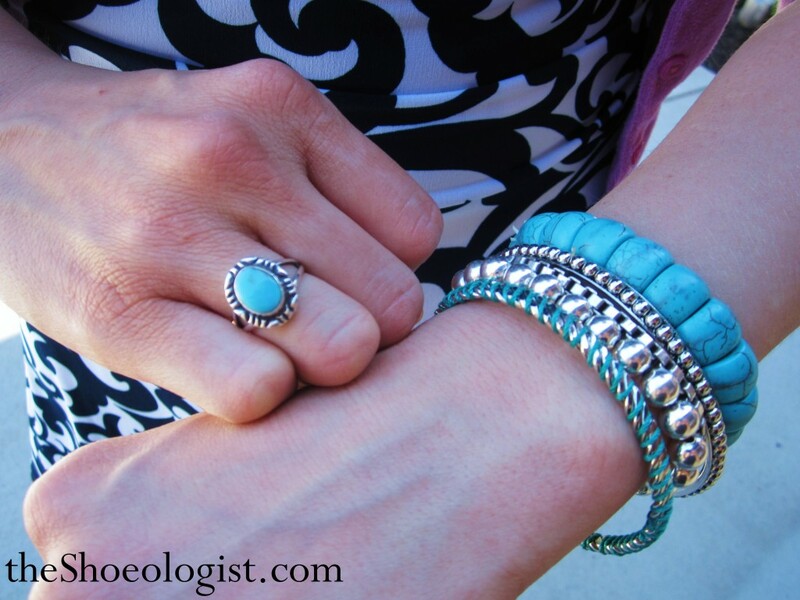 **This post is part of Kayla‘s 21 Day Challenge, Layer Accessories. Check out the rest of the participants in the Flickr group here. This week I’m posting all about party shoes, the ones I rarely wear but still are so beautiful I get butterflies in my stomach when I think about them. 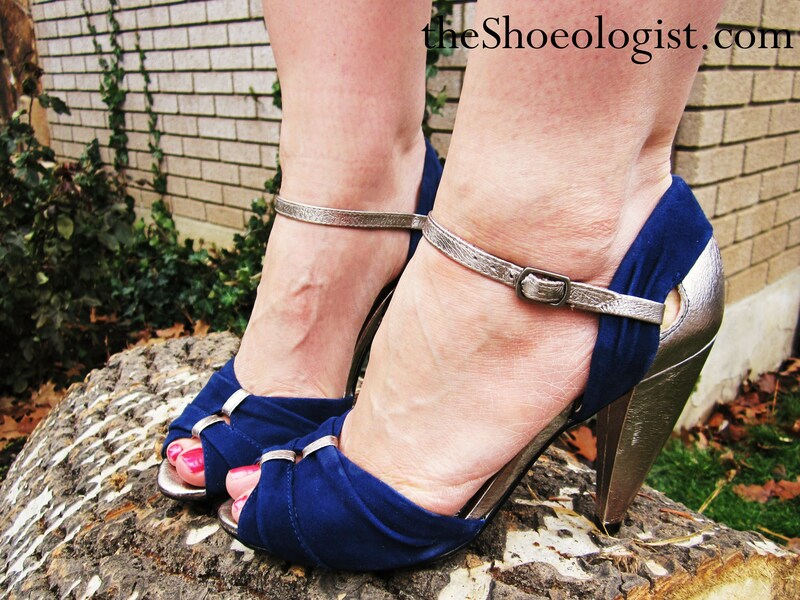 See other party shoe posts: pink satin peeptoe heels, and silver sparkly strappy sandals. There are not many aqua evening shoes around the interwebs, but here are a few heart-stoppers. 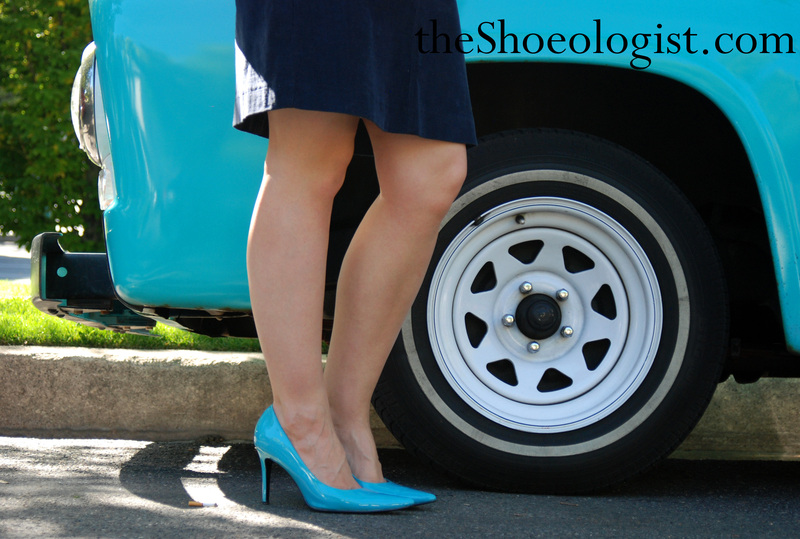 Navy blue suede pumps with 3.5-inch heel and square-ish toe. These were a hand-me-down from my favorite aunt, they are Italian made and a classic regardless of that Elvis song. Looking around the Interwebs, I found this navy suede platform pump and this lovely pointy-toe version from Nine West , I also really like these brighter royal blue suede pump from ZiGiny . Hello? Is this thing on? I would first like to thank the gaggle of guest posters who filled in for me while I was away. I can’t tell you how much I appreciate it! I would also like to thank pinksuedeshoe for babysitting things here in my absence, best twin ever! (Yes, she’s really my twin. Don’t freak out.) I’d like to thank the Academy….wait. No. That’s not right. At any rate, I’m back! I spent a lovely week lounging in the sun and exploring the Mexican Riviera! I managed not to take a single picture of my feet, because apparently the combination of tropical sun, absolutely no responsibility and a lot of fresh pico de gallo and delicious burritos will make me completely lose my head. 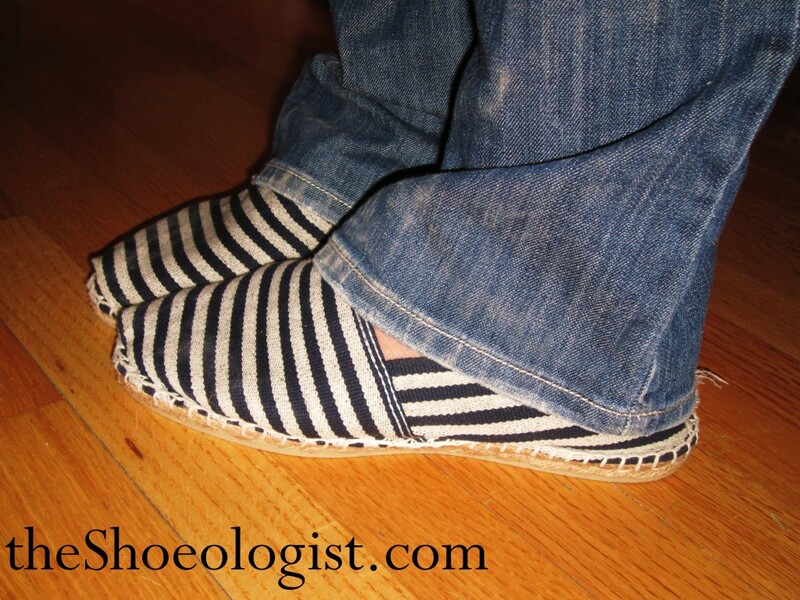 Espadrille/deck shoe in navy and cream stripe with thin rubber tread by French Sole. 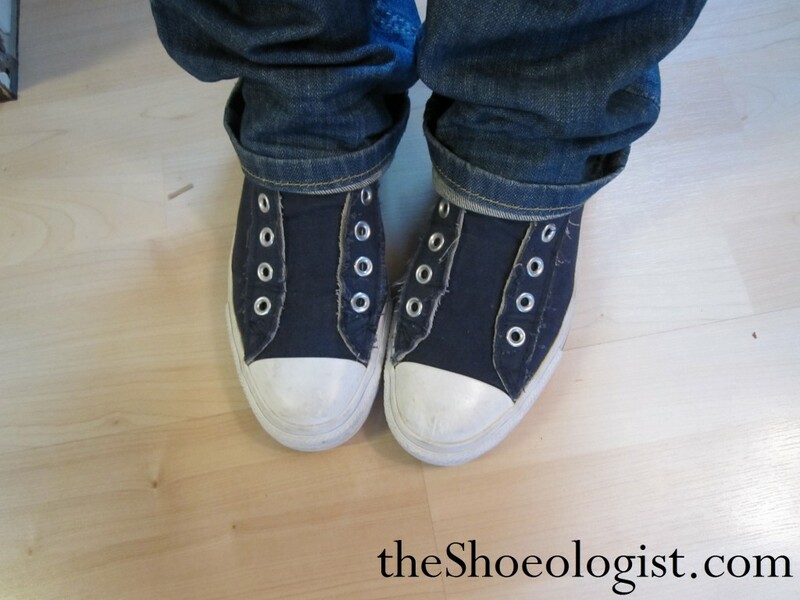 I’m pretty sure these shoes are ambidextrous, or whatever it’s called when there isn’t a right shoe and a left shoe…there are just two shoes. I have switched them up a half-dozen times and I can’t figure out which one, if either, is supposed to go on my left foot and which on my right. Whatever, I love them. They are comfortable and soft and over the course of the last week were well loved and often worn. I’ll get back to “real life” today and tomorrow; you know, an 8-5 job, tackling the medium-sized mountain threatening to topple across the room, grocery shopping and vacation detox, but for now I’m trying to fend off the icy cold another day by shuffling around the house in these soft, stripey shoes. Seychelles Little Owl Sandals in navy blue suede and silver metallic leather, with 4-inch heel and peep-toe. I have been looking for some navy blue footwear for several months now and when I accidentally slipped into Nordstrom yesterday I had no intention of even buying shoes. But they were having a sale. And as I scanned the racks of discounted shoes my eye zeroed-in on these beautiful suede and metallic heels. I audibly gasped. And when I tried them on it was all over, they simply had to come home with me. What? They were on sale! Besides, they go perfectly with my dress. 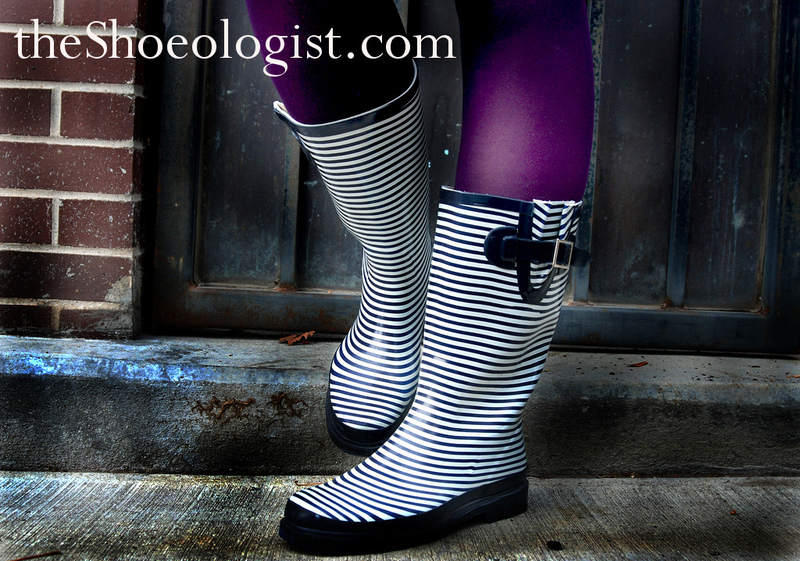 Make sure to enter my giveaway for a FREE pair of Muckboots! Contest is open until December 15, 2010. Colin Stuart for Victoria’s Secret, pointy-toe stiletto with 4-inch heel in aqua patent-leather. I found these on a fantastic clearance sale for less than $20 dollars and bought them without a clue as to how to wear or style them (I don’t usually say things like “How do I style these shoes?” but I just watched three back-to-back episodes of Project Runway and my vocabulary is all skewed in favor of Nina Garcia). 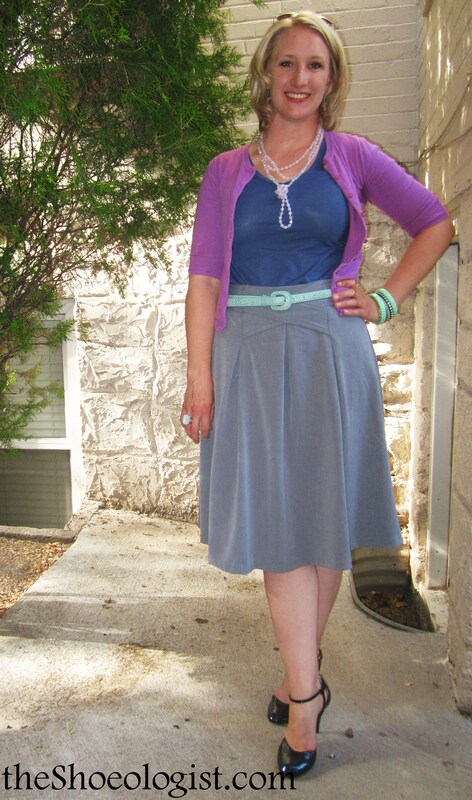 Today’s ensemble was a gray skirt, black-and-white striped T, light blue cardigan and hot pink patent-leather belt. Perhaps a little Barbie-ish, but I loved it.